Sky Zone isn't just for the big kids! 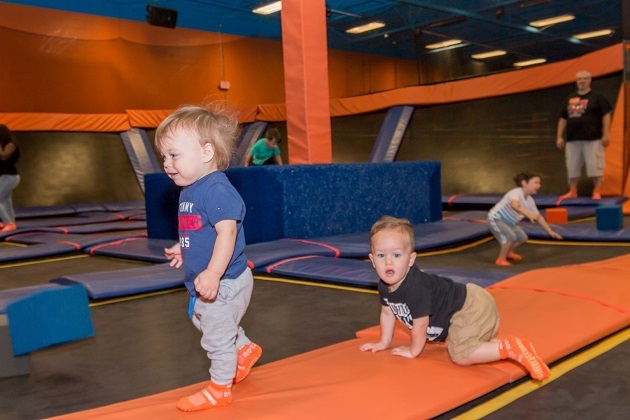 Little ones can enjoy jumping and being active during Sky Zone Tampa's Toddler Time events. Every Wednesday from 10 AM to 12 PM and Sundays from 9 AM to 11 AM, kids ages 7 and under can bounce their hearts out without worrying about interference from bigger bouncers. When school is out, Toddler Time is scheduled for Wednesdays from 9 AM to 11 AM. This event is perfect for little ones of all ages; if they can walk, they can play on the trampolines during Toddler Time! Toddler Time is the perfect way to share some quality time while also getting your hearts pumping! Parents, grandparents, and adult guardians can supervise their kiddos and also join in the fun. Each child plus one parent get to jump for just $12.99. Additional adults accompanying little ones can play for an additional $5.99. SkySocks are sold for an additional fee. One of the most fun aspects of Toddler Time is the character meet and greets. Each week, kids have the opportunity to interact with friends from their favorite TV shows and movies. Characters include Chase and Marshall from Paw Patrol, Peppa Pig, Trolls, Olaf from Frozen, Mickey and Minnie Mouse, Catboy from PJ Masks, and the Minions. Little ones can take a break from bouncing to share a hug and take photos with these fun characters, which makes for fun memories for kids and parents! Did you know that Sky Zone Tampa also offers Toddler Time birthday parties? Grown-ups can schedule this package during regularly scheduled Toddler Time events on Wednesdays and Sundays. This fun, active, and unique party option is perfect for little kids who have a lot of energy. For just $149, we can accommodate up to 10 jumpers ages 7 and under. Parents can add additional little bouncers for only $8.99 each. Plus the birthday child and parents (1 per paid child) jump free! Each jumper gets a snack and juice box to enjoy during their 30 minutes in Sky Zone's party room. Then it's off to make fun memories during a 90-minute jump session on the trampolines. Don't forget that kids will have the opportunity to interact with their favorite characters! To book the birthday party of a lifetime, call us or book using our convenient online system and we will help you plan a gathering your little one will remember forever!